My name is Kathleen Schlentz and this campaign is for my good friend, Willie Ortiz. 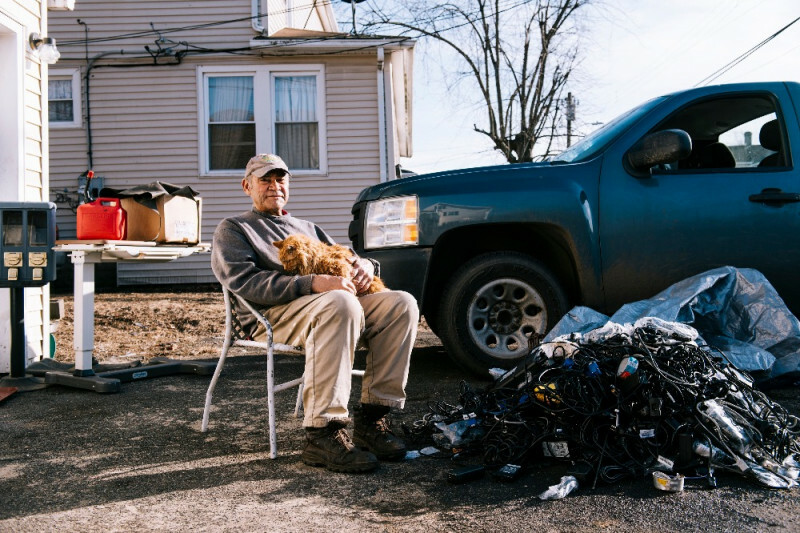 Everyday, 77-year-old Willie scours his town and near by towns for scrap metal, loads up his truck, and sells it — for cat food. Now we are honoring the work that he has been doing in the Hartford and East Hartford, CT areas and helping him continue his mission. For the last 24 years, Willie has been spay, neutering and vaccinating feral and stray cats and feeding them nightly. He has not missed a night of feeding despite the rain, snow, freezing weather or his own health issues. He only misses the nights when it could endanger the cats, when the snow is over 3 inches high. He spends his days collecting scrap metal to pay for these services and food, but as the cat population grows that is simply not enough. Donations made to this campaign will be used to help keep the cats fed, secure his mission for years to come, and allow him to get more cats spayed, neutered, and vaccinated — all of which costs at least $40 per cat. I have never met a more committed person - Willie unknowingly inspires me in so many ways. Knowing him has made my life better, just by doing what he does so effortlessly. He is a loving, caring, and honest man who believes very strongly in God and all of his goodness, despite the pain and sadness he sees. He is a Veteran of the U. S. Army, a husband of 53 years to his wife Alaja, father of two, and grandfather of four. He loves all animals, but he recognized the problem with the feral and stray cat population in and around the Hartford and East Hartford areas. He knew this was going to be his mission. Willie's cats are all very healthy because he makes sure they get what they need to have as good and healthy a life as possible. The life expectancy for a feral or stray cat is 5 years. Willie has cats he has been feeding for 15 years and longer. But the cat colonies are constantly changing, with new cats wander in or get dropped off by people that won't or can't care for them. Willie makes sure that the newcomers get spayed and neutered as soon as he can trap them (in a "Have a Heart" trap, of course). He makes “cubby holes” for the cats to keep warm in the snowy New England winters. He takes pregnant mothers to his good friend, Roberta where they can have their babies out of the cold. Once they are wined from their mothers, spayed and neutered she finds forever homes for them (and the mothers if they are adoptable). When Willie finds friendly adoptable cats, Roberta will find forever home for them as well. Right now, the most important thing to Willie is slowing down the feral and stray cat population as soon as possible - this is the only real solution. 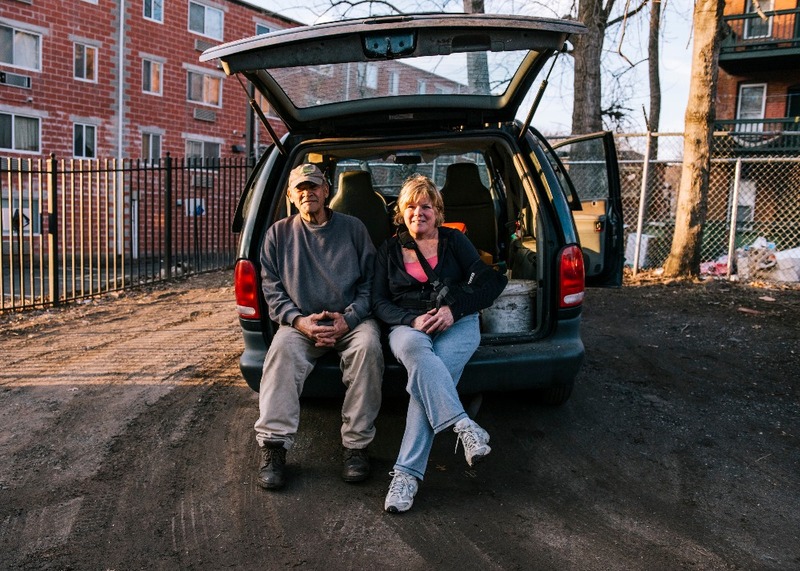 To pay for all of his efforts, Willie hunts for discarded scrap metal every single day. 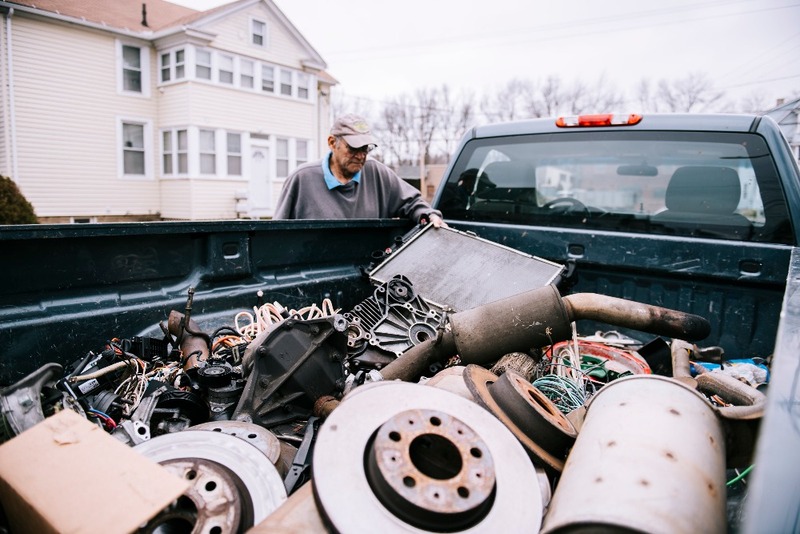 People also call him to make donates and he has connections with various businesses, that so kindly donate scrap metal on a continuous basis. If there is anything that he can sell for a higher dollar, he sells it on Craigslist to make a bit more money for his cats. Willie and I have worked together to apply for non-profit status and I will be withdrawing the funds directly to our new non-profit bank account. All the funds from this account will be used for the purposes outlined in our campaign here. Willie and I have some exciting news to share with all of our amazing supporters. Connecticut Feral Cats is now in the process of becoming an official non-profit organization and Willie will be able to continue his mission for many years to come! This incredible feat would not have been possible without the huge outpouring of love from each and every one of you. We are also so grateful for the continued support from the GoFundMe team throughout this entire process. Thank you from the bottom of our hearts to you all! Thank you all so much for your continued support! Willie still cannot believe this is happening to him. But true to form, he continues to search for scrape metal everyday. He says he can't take anything for granted and he will continue "scraping" until he no longer can. Willie's plans are to continue his mission for as long as possible and to have someone in place, to take over when the time comes. We will never be able to thank you for all of your love and support. This blessing will sure come in handy for all the years he has left!!!! April, 12th my intention was to sent all of you a personal "Thank You". Which meant typing one at a time. I knew it would be a big task, but it was worth it. I really wanted all of you to know how much we appreciated your heartfelt donations. I got about 1,200 typed in almost 4 days and nights, by then the donation count was over 6,000. I finally admitted to myself that I wouldn't get it done before years end. So reluctantly I accepted defeat. So officially Willie and I would like to thank you from the bottom of our hearts❤️❤️. The donations that have been sent, along with the love, support and your generosity is just unbelievable to us. This would never have been possible for Willie without all of you! April's 2018's "Go Fund Me Hero". This is such a huge honor! Every month Go Fund Me scours their thousands of Go Fund Me campaigns, and chooses one that stands out to them as the Hero for the month. Of all the thousands of people that they could have chosen, they chose Willie! This could not have happened without all of the love, generosity and support he has received because of you and his Go Fund Me champaign. Willie and I thank you from the bottom of our hearts. Also, thank you Go Fund Me for recognizing that Willie is a true hero! We are located in East Hartford and have 100's cans of cat food and dry food. Does he have a place we can drop off for him? I just donated in memory of my dear friend Henya's mother, Chava Bas Sara. She loved and cared for strays in Tel Aviv Israel. Well, glad you guys created a go fund me account that is getting some donations. I was inspired by Willie and did the same on February 9th. I will take my site down and point people in this direction. Great minds think alike I guess. I just donated 36.00$ in memory of my beloved Dear One who passed away at this time of year. I pray that she is playing happily with my other beloved and missed cats, Boychik and Bootsie. She was a stray and know that Willie loves each and every one his cats just as I loved mine. I wish him continued strength and success in his wonderful mission of giving tender loving care to all of his cats. You make the world worth living in. Beautiful story, beautiful man, beautiful cats! May you go from strength to strength and much continued success in your compassionate care for these wonderful but unfortunate cats. Kathleen and Willie, I worked at HH for over 30 years. Every day, we were greeted by some of Willie's cats as we entered and left the ERC (former school of nursing) building. There was even a plaque mounted in memory of our favorite feral on the side of the building -put there after this majestic kitty's passing. I think the kitty's name was Mario. But, thank you Willie for the work you are doing. And, thank you Kathleen for helping him. I hope he gets way more than what goal is! What a selfless man! We need more.people like him. I am blessed to donate. I started a fund for my feral cats, ferallivesmatter . I was only able to raise $175. I currently have 38 cats in my colony. Have fixed 15 so far but I have no more money. Glad someone is getting support for our furry angels. Yay! The amount of money he is getting makes me so happy! I can't think of anyone more deserving! Is there an address where donors can have kitty supplies sent to Willie? What a wonderful human being. It's easy to feed stray cats, but few people take the necessary step of spaying and neutering. Soon, you will have more cats to feed! All it takes is a trap and a hungry cat. Many vets will neuter feral cats at a reduced cost. I hope that everyone who loves cats will do their part to help reduce cat population! Thank You for your service and all the wonderful things you continue to do for these beautiful cats. God Bless You, Sir. I think it's a wonderful thing Mr Ortiz is doing and I want to help. 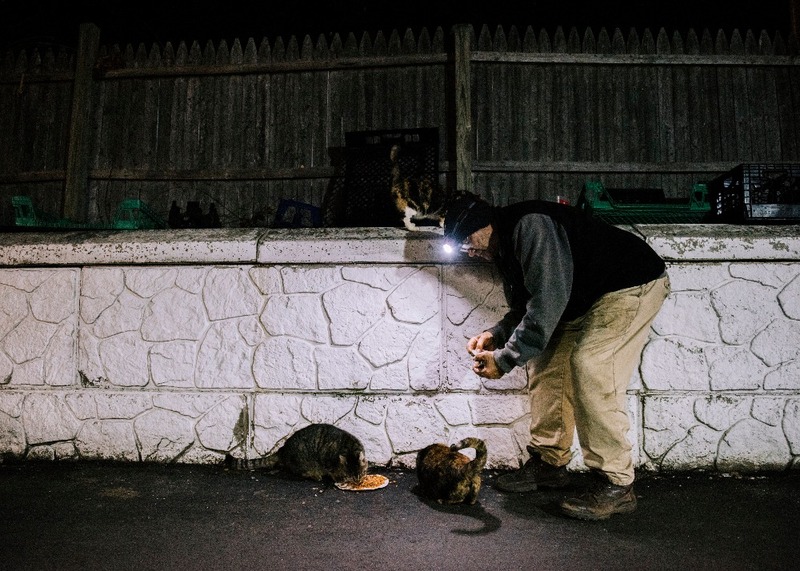 I was touched by Mr Ortiz's devotion to help the Hartford's feral cats and after reading the article in the UK, I wanted to donate to.keep the legacy going. Hopefully others will follow suit for a good cause. Thanks for your inspiring work to help the cats.